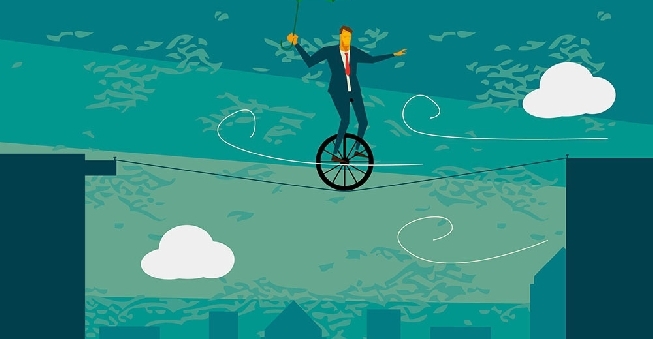 How can you inspire creativity in your business? We've got the answer for you. If the free flow of ideas is important to business operations, regardless of whether you’re a sole-trader or a business with 20 employees, you’re going to want to build an environment that breeds creativity. You’ve probably already heard about Google’s crazily creative office setups, each one different from the last—an indoor slide, chalets inside the office, rooms built to look like forests—but, they’re not the only ones doing it. In fact, a number of other companies have come up with incredibly creative office setups. We wanted to turn to someone with a little less press than Google, but as much creativity to show you that no matter what size business you own, there are always small ways to boost creativity. Leerom Segal, CEO of Klick Health, helps turn your office space into a creative workplace. 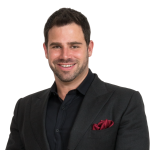 Leerom Segal is the CEO of Klick Health, a digital health agency based in Toronto. Although Klick Health focuses on providing digital services for the healthcare industry—a typically less creative industry—Segal has found a way to circumvent the problem. As is the case in traditional digital agencies, creativity is essential to the longevity and future success of Segal’s own business. And, it’s important that everyone—CEO, designer, and account manager alike—be a part of it. So, other than tossing a new coat of paint on the wall, how do you go about designing the kind of workspace that gets the creative juices flowing? Segal has five tips, and we’ve added a few of our own. Your office doesn’t have to have cubicles, rolling desk chairs, and drab carpets. You can spice it up. In fact, Segal says you should. And don’t stick to making just the immediate office more creative, think about the boardroom. 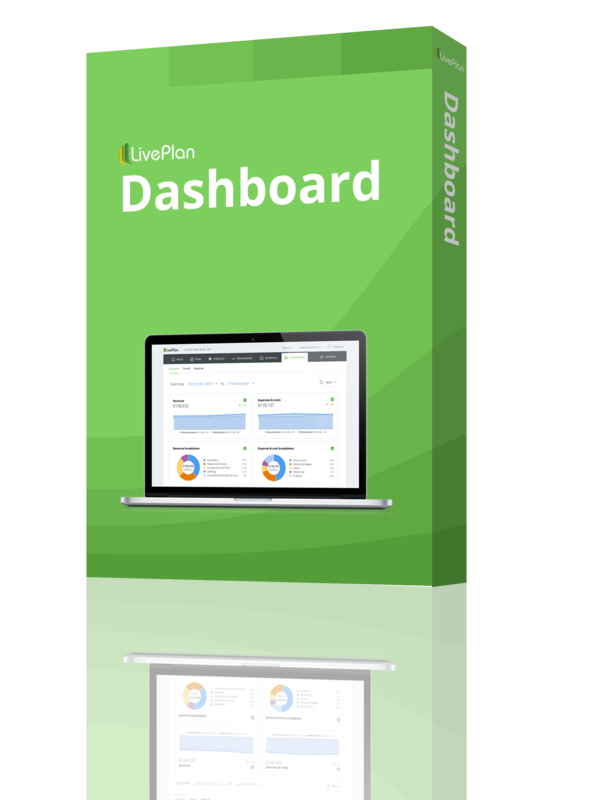 Think about the meeting room, the kitchen, even the bathroom! Creative bathroom or just working with the neighborhood? Powell’s bookstore in Portland, Oregon has done just this. 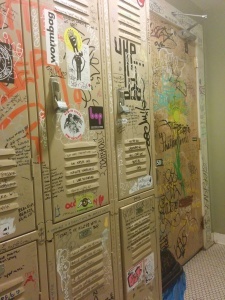 To spice up a very dull bathroom (and to fix vandalism that was probably once a problem), they’ve added school lockers, graffiti included! Whether or not these lockers work, they have the effect of turning what might otherwise be a fairly grungy bathroom into something that’s a little more eclectic and perhaps worth a photo or a mention in a blog. I’m not saying bookstore workers are going to have creative breakthroughs here, but it’s going to be a good deal more interesting going to the bathroom. Even if new furniture isn’t in the cards, ornaments, books, and bookshelves can make a big difference. The mere presence of books is said to foster an environment that promotes learning and creativity, while a vase of flowers or a series of modern paintings can set a more creative and relaxed tone. Try adjustable workstations that allow employees to stand while working, yoga balls as chairs, or treadmill desks. If your budget is the problem, don’t feel bad about turning to Goodwill stores, antique stores and furniture liquidators, or even to sites like Craigslist. If you’re outside of the US, Gumtree is a good alternative. 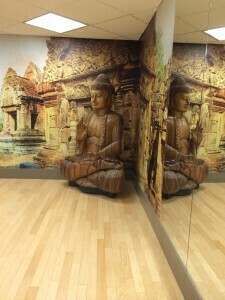 The yoga studio at Kick Health gives employees a place to blow off steam. When the idea well goes dry or a particular project isn’t going well, you and your employees need a way to work out these frustrations. For this very purpose, at Kick Health, the company offers a gym, complete with yoga studio. If you don’t have the means or space to add a workout room, don’t worry. You can team up with the local gym and offer employees a discount, or let employees go for a walk during the day. And what about trying a schedule that allows employees to work from home? The idea here is to trust your staff to manage their time. When they’re not confined to a strict schedule, they’ll feel less pressure and will in turn be able to generate more productive ideas and let go for a bit. At the Klick Cafe employees can eat lunch, play games, and work together on projects. 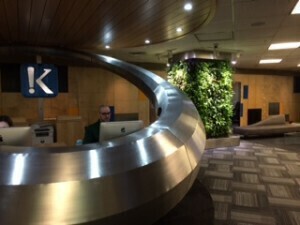 Living plant wall in the reception area of Klick Health. Believe it or not, it’s okay to have fun at work. Segal suggests adding elements that encourage employees to take a break and do something a bit out of the norm. For example, fill a filing cabinet with slinkys and squishy toys so employees can take a break. Or, create fun team workspaces. For example, add some tabletop games to your lunch room, so employees can play a game before working on a project together. Nature sparks creativity, so bring a touch of the outdoors into your office. Really. A study conducted by the University of Exeter found that office plants can help boost staff well-being by up to 47%, and increase creativity by 45% and productivity by 38%. The study took place at the Chelsea Flower Show and compared participants’ effective output in 90 experiments and across different types of business spaces, ultimately finding that those spaces that included the most plants or greenery made people happier, more creative, and in turn, more productive in the experiments performed. Klick Health has several living plant walls to bring a little nature indoors. You could try a living plant wall, or consider using plants as room dividers. When you’re making improvements to the office, make sure you get input from your employees. Call a team meeting where you toss a ball around in a circle. Whoever catches the ball shouts out a new suggestion for the workplace. Keep a running list of ideas and then have employees vote on their favorites. It’s a great way to keep employees involved. Do you consider your office a creative workspace? What did you do to make it this way? Share your ideas with us in the comment section below. Feel free to add a picture!